This summer, CHIP’s food systems team reached out to hundreds of San Diego County farmers as part of its broader work to build the institutional market for healthy, fresh, local produce. 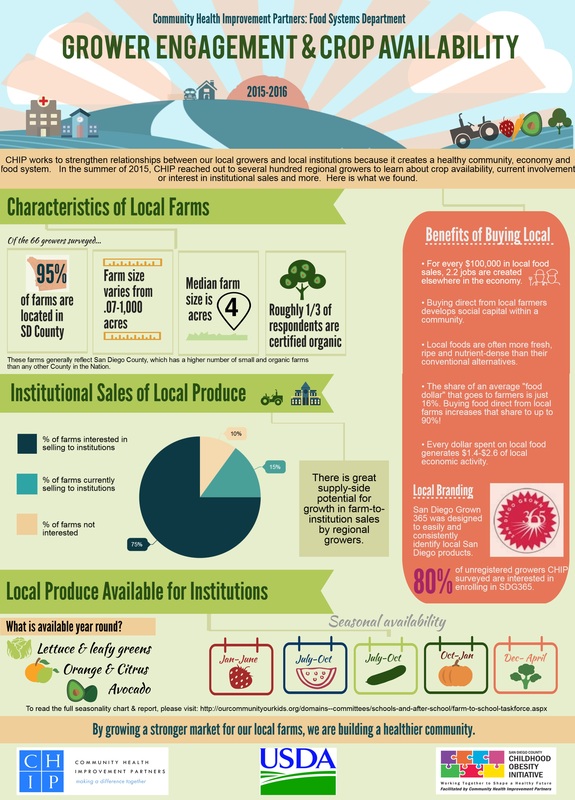 The goal of this engagement was multi-faceted and included market research to create CHIP’s 2015 Crop Availability Chart, outreach about the San Diego Grown 365 brand, recruitment for our Let’s Go Local! Produce Showcase, and more. Using CHIP’s growers database of over 1000 Southern California farms, we prioritized outreach to San Diego County farms we knew were already selling to San Diego County institutions or were interested in doing so, those certified to sell at SD County farmers markets, those who have attended CHIP events (i.e. grower trainings and the Let’s Go Local! Produce Showcase), and those for whom we had recent contact information. We divided all growers in to four outreach groups, with roughly 100-150 growers in each group. We then consolidated all our grower engagement and data collection goals for 2015 into one handy-dandy outreach tool. This survey included questions on basic farm characteristics (i.e. location, size, liability insurance coverage), and whether the farm currently sells to institutions or is interested in doing so. We also tacked on several questions regarding current use or interest in the San Diego Grown 365 brand, a local brand owned by the San Diego County Farm Bureau that consistently identifies local products for consumers and is free to use for SD County producers meeting certain guidelines. The bulk of the outreach tool consisted of matrices that gathered projected crop availability for 75 fruits, vegetables, and herbs from September 2015-August 2016. Lastly, CHIP also asked about interest in participating in this year’s Let’s Go Local! Produce Showcase. We then spent several months reaching out to farmers, first with a web-based survey and then through thoughtful 1-on-1 calls to growers where we completed the survey over the phone. In our experience, there is no replacement for thoughtful, personal outreach to farmers! In total CHIP reached out to about 400 farms by email and 250 by phone. Several months later, the results were in and we had gathered high-quality information from roughly 70 farms. That’s nearly a 20% response rate for people emailed and a nearly 30% response rate for people called. For anyone who has ever conducted outreach to a big group of farmers with a voluntary survey, you know that 20-30% isn’t half bad! 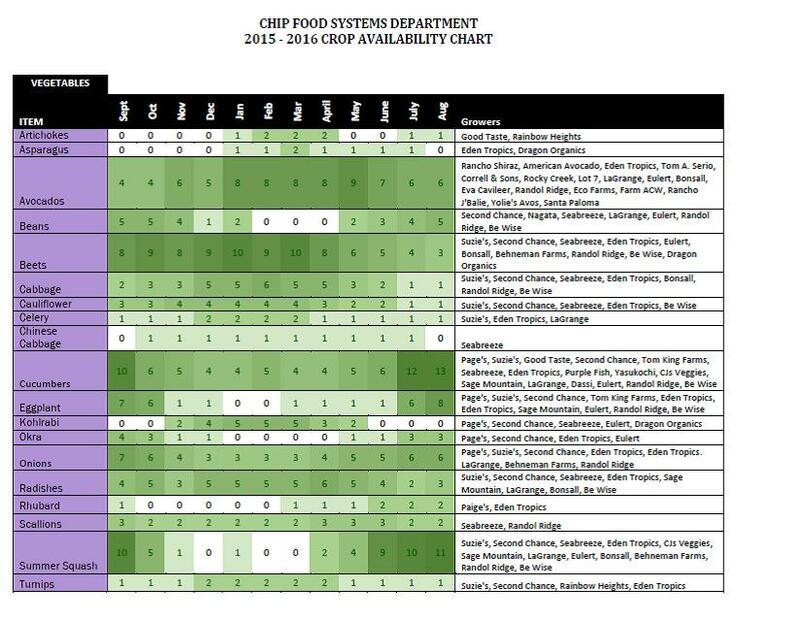 The main result of this outreach to growers was the creation of CHIP’s 2015 Crop Availability Chart. 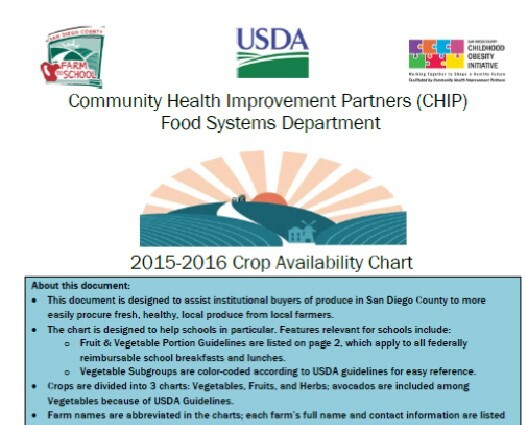 CHIP publishes this tool every year in order to help San Diego County schools and other institutions more easily procure fresh, healthy, local foods. The tool includes comprehensive crop availability of 50 San Diego County farms for 75 fruits, vegetables, and herbs. The chart is color-coded for easy use and shows monthly variation in projected crop availability both within and across crops. Grower contact information and a map of respondents is also included at the end of the chart. Improvements in this year’s Chart is the refined method for showing month-by-month availability and the sheer increase in volume of information. the 2014 Chart includes 26 growers whereas the 2015 Chart has 49- that’s a 92% increase! The 2015 Crop Availability Chart is accompanied by a Grower Engagement Research brief summarizing key characteristics of farms engaged, as well as a stand-alone one-page infographic that attractively summarizes main findings of our grower outreach. Feel free to share the infographic (or this whole blog post) on your social media accounts! Another interesting fact we learned from this outreach is that the relatively low participation in the Farm Bureau’s San Diego Grown 365 (SDG365) brand may be due more to a lack of capacity for outreach than a lack of interest by growers. Of the 30 growers we reached that do not currently use the SDG365 brand but are eligible to do so, 80% are interested in enrolling in SD365! Overall, we consider our summer outreach to local farms a big success. We streamlined the data collection process, increased the amount of data gathered, and improved the tools used to communicate our findings. The tools we recently developed were shared at the most recent San Diego County Farm to School Taskforce meeting, which was just profiled on the California Farm to School Network blog, and have been sent out to hundreds of partners locally and statewide. CHIP is also integrating these resources into its partnership with University of California San Diego (UCSD) in its implementation of the Harvest of the Month (HOTM) program, a partnership in which CHIP provides expertise on local food procurement for schools participating in the HOTM program. We hope these tools will make buying monthly HOTM produce items much easier for participating schools and other entities. We have also shared our results with our local Farm Bureau so they can follow up with growers interested in the SDG365 brand. The outreach also helped identify vendors for our 2015 growers workshop and the upcoming Let’s Go Local! Produce Showcase. We are also planning to present these results to local groups including the County of San Diego’s County’s Nutrition Action Partnership (CNAP) in early October, the San Diego Food System Alliance in November, and in an upcoming statewide call with the California Farm to School Network. There is a crucial need for this front-end outreach to growers and we here at CHIP are always working to strengthen our relationships with growers and improve the information available on the local food system to food-buying institutions. After all, building the market for healthy, fresh, local, sustainable food is no easy task. It requires both buyers and sellers to “go the extra mile” (so that the food you purchase doesn’t have to!) and we believe these tools are essential parts of an institution’s local food purchasing toolkit. If you have any questions about how to use these tools, or how to create similar tools for your area, please don’t hesitate to contact us!